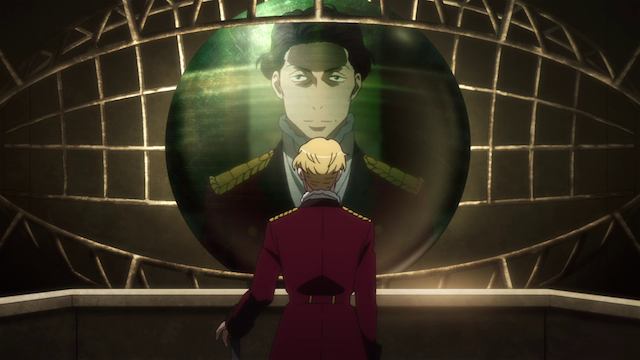 Creepy vilains teleconference between space castles in Aldnoah Zero. Aldnoah Zero is off to an interesting start. I like that at this point the “good guys” are completely out-gunned, but obviously have a couple of aces about which they are unaware. I’m not particularly fond of the characters or the art style, but there is some potential for a good story, so let’s see how this plays out over the next few episodes. Trying to get some work done in Barakamon. 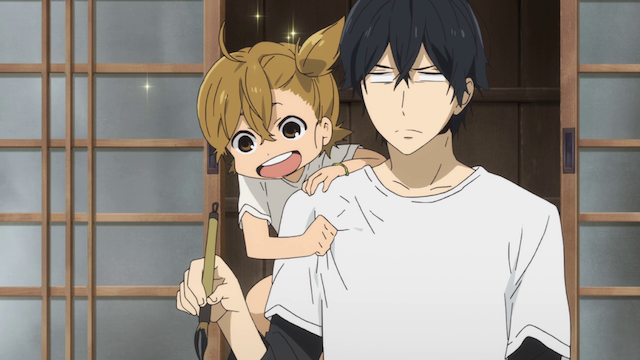 At this point, Barakamon is probably my favorite show of the season. 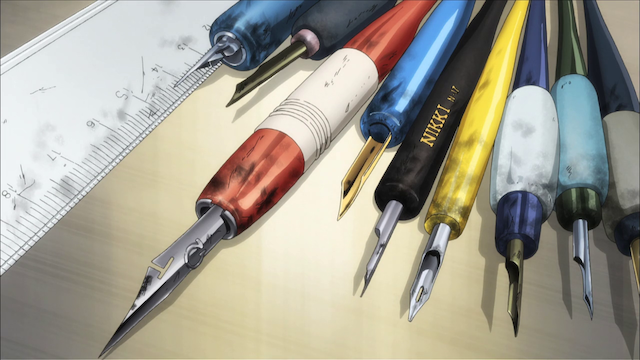 I really like shows that incorporate the arts, and this one, about a calligraphy artist struggling with personality problems is very well done. The show is mostly light in tone, with pauses at just the right moment to be serious. I also think the artwork in a show like this is quite important, and Kinema Citrus is doing a great job of combining a more refined style for the setting (a rustic village on an island), and most of the characters, with a looser, more energetic style for Naru (“the town scamp”). I’m looking forward to seeing how this develops. 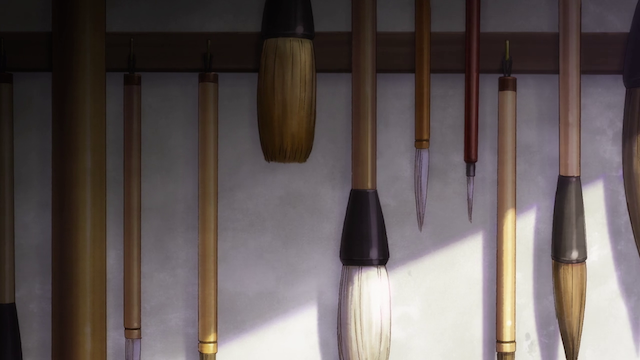 The master’s tool set in Gekkan Shoujo Nozaki-kun. 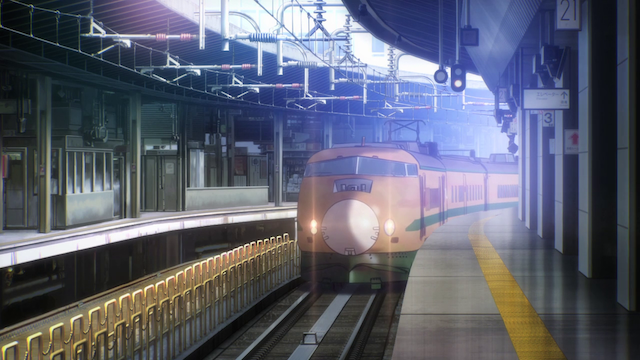 Doctor Yellow makes an appearance in Rail Wars! I don’t think it is likely that this will be one of the best shows of the season, but it certainly has an unusual setup. Taking place in an alternate world that is exactly like ours, only where the Japanese have nationalized their train system, this series follows the on-the-job actions of four new recruits in the JNR security force. The first episode was kind of so-so, and there was an over reliance on fan service, where we could have used some characterization, but I can’t help but believe that the setup is too specific to not be put to some real use in upcoming episodes. 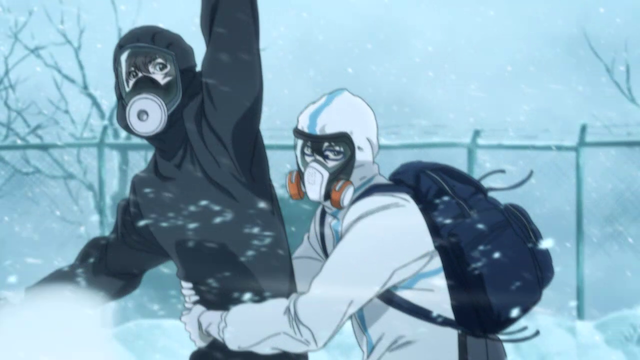 Good times on a snow bike in Zankyou no Terror. Finally we have a series that many have selected as a clear front-runner before the season even began. Given the association of Shinichiro Watanabe and Yoko Kanno, this is another one that couldn’t help but generate pre-season buzz. Fortunately the first episode pretty well lived up to the hype. The artwork was good, and there were several action scenes that were very well handled. The story is still mysterious, so there is plenty to look forward to there. I like the fact that the main characters have yet to be clearly defined as either good guys or bad guys. I don’t know if I will keep all of these shows, but I’m glad to see the season has turned out to be more engaging than I was at first thinking it would turn out to be. If even two or three of these shows turn out to be pretty good, I’ll be happy with the crop. Yes. I’m pretty pleased with the way that show is shaping up. The way the whole season is shaping up, actually. Rail Wars never crossed my mind to bother watching, which is weird as I do like trains, but I’m not so sure about the story of it. However it’s not been mentioned twice to me as being good. May check it out. I have to say though, my favourite so far is Hanayamata. Have you had a look at that one? Yes. I’m watching that one still, but it has not convinced me that it will try to be anything more than “cute girls doing cute things”. If they really start taking the yosakoi element seriously, it could get good, because the artwork has been nice. So far I am not convinced we will get there, but it is early still, so I am watching and waiting. Yeah, i know what you mean, I really want them to get to the Yosakoi soon, I really love the artwork so far and hope they don’t just leave it like this so far.